One of the benefits of being a professional athlete is having a platform to make a difference in the community. 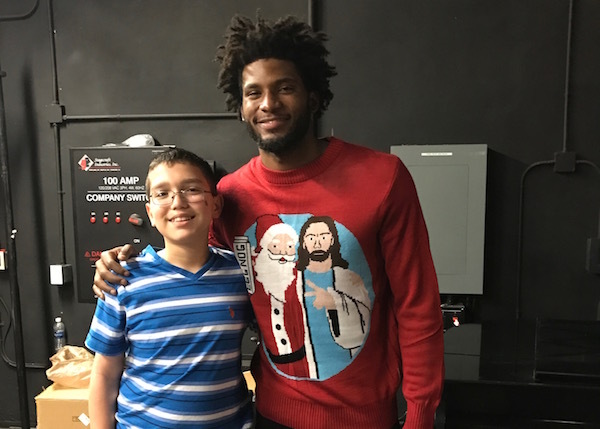 Recently, Miami Heat forward Justise Winslow gave back to Miami by providing local kids the chance to showcase their talent in a positive environment. Winslow hosted the inaugural D.R.E.A.M Showcase, a talent show at which 25 children from Miami schools performed in front of their families and peers. The event was held at the historic Lyric Theater in Miami. It featured singing, dancing, acting, and poetry. Winslow got in on the action, reading a poem he wrote entitled Dreams, which was the theme of the showcase. The talent show was presented by Robin’s House Family Foundation, a charity that Winslow and his mom, Robin Davis, started in 2014. The charity exists to help children and young adults reach their highest potential through education, recreation, and community outreach. Winslow seemed excited to watch every single kid put on a show. He always had a smile on his face, and he even joined in on some of the performances. One of the only rules at the show was that the crowd could not give negative reactions to any of the performances. Winslow thinks the show had an impact on the kids performing, and he says the positive reactions helped make the event impactful. Once the show ended, the guests were given a surprise performance by rapper Fat Joe. Winslow joined the rapper to perform one of his hit songs. Rapper D-Lo also made an appearance toward the end of the show. Once the impromptu concert finished, all the kids who performed or watched were given swag bags, which included Beats brand earbuds. A first round pick in the 2015 draft, Winslow is in his second season with the Heat. Despite playing only one college season at Duke, he still left behind a legacy of service in Durham. Winslow would hang out with the kids at the Emily K Center, named for Duke coach Mike Krzyzewski's mother. He visited patients at the local hospital. And he worked clinics that Duke held to let kids showcase their basketball skills. Today, Winslow’s foundation is giving back to the community in all kinds of ways. The charity hosts basketball camps that focus on skill development and having a healthy team attitude. His foundation also focuses on youth mentorship, a program that was created to improve the well-being of children by providing a role model that encourages positive attitudes and building relationships. As his NBA career continues to flourish, Winslow wants his foundation to continue to encourage people to reach their full potential.